Carol Sutton (b. 1945) is a distinguished American-Canadian abstract painter. 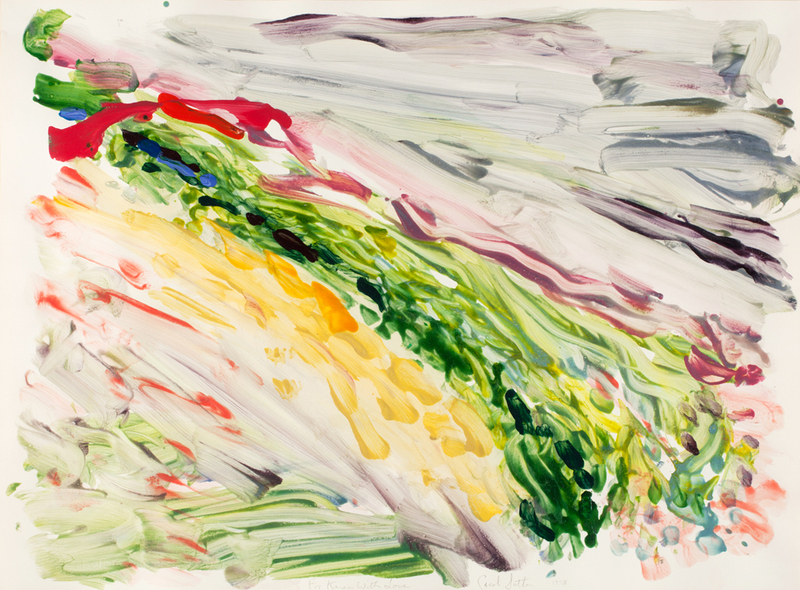 She is best known for her large-scale abstract paintings and her sensuous, gestural brushwork. As an artist, Sutton is interested in the formal aspects of art-making; this includes colour, technique and composition. For Sutton, the expressive potential of colour has often served as her source inspiration. This untitled painting depicts a cascade of bold colours fanning out diagonally, with gestural sweeps and diaphanous loose spatters orchestrated on opposing ends. The hurried, semitransparent application of paint exposes the weave of the canvas, calling attention to the material conditions of painting. This is typical of her early to mid-career work, when Sutton’s paintings employed the tenets of modernism, disavowing three-dimensional space and figurative representation. In 1974, during her early career, a studio visit from famed American critic Clement Greenberg would instill a formalist approach in Sutton’s paintings and inspire her “fan” series to which this untitled painting belongs. Roughly contemporaneous to this work’s making, Sutton also participated as an artist-in-residence at the Emma Lake Artists’ Workshop at the University of Saskatchewan. The presence of preeminent avant-garde artists, among them sculptor Anthony Caro and painters Barnett Newman and Kenneth Noland, informed the workshop’s approach with a rigorous, formalist focus. The combined influence of Greenberg and these experiences at Emma Lake richly influenced Sutton’s works of the period, as seen in this untitled painting. Carol Sutton earned her MFA from the University of North Carolina at Greensboro and a BFA from Virginia Commonwealth University, Richmond. Sutton has exhibited her work nationally and internationally at the Museum of Fine Arts, Boston; the Canadian Cultural Centre, Paris; Canada House, London, U.K.; and the Art Gallery of Hamilton. Her work is represented in the collections of the Museum of Fine Arts, Boston; the Smithsonian American Art Museum, D.C., the Fitzwilliam Museum, Cambridge, U.K.; the Barcelona Museum of Contemporary Art; and the Agnes Etherington Art Centre, Kingston. She lives and works in Toronto.